Aliases: "Lady Magdalena" (name on Earth-Morgan Conquest). Powers/Abilities: Magdalene has superhuman strength (approximately class 50), enhanced agility, and reflexes, and is an incredibly proficient fighter. She also wields a power lance capable of firing powerful energy blasts, opening spatial portals, and reflecting back energy attacks, as well as serving as a highly effective melee weapon. Her natural durability is further enhanced by a form-fitting suit of highly resiliant armour. History: (Avengers I#355 (fb)) - While Magdalene's origin is unknown, she was once an Avenger in her native timeline, which was destroyed by the insane Sersi of her dimension. She was the last survivor of Sersi's onslaught and was saved by Proctor, who recruited Magdalene as one of his Gatherers. She served along with Cassandra and Sloth, and later the Swordsman (Phillip Jarvert). (Avengers I#343 (fb/bts)) - (Avengers I#344(FB)-BTS) - A grateful Magdalene began to feel something more for her savior, but when Proctor rescued an extra-dimensional version of the Swordsman, Magdalene began to fall in love with him; a humiliating moment for the possessive Proctor. Despite the uncomfortable situation, Magdalene and the Swordsman stuck by Proctor, helping him to achieve his goals. (Avengers I#343) - Apparently under the direction of Proctor, Magdalene and the Swordsman laid a trap for the Avengers by sending a phony distress signal from the Human Torch asking the Avengers to stop by the Fantastic Four's headquarters. However, when the Avengers got there, they were ambushed by Magdalene and the Swordsman. (Avengers I#344) - Catching the Avengers by surprise, Magdalene and the Swordsman managed to fend off much of the team. When the Swordsman was attacked by Hercules, Magdalene jumped to action, overpowered the god and handled the Vision and Crystal as well. After he was hit by the Black Knight's laser-sword, Magdalene rushed to the Swordsman's side and teleported away, leaving the Avengers in a state of confusion. Returning to Proctor, Magdalene begged him to heal the Swordsman. When he did, Proctor reminded her that she once felt for him what she now felt for the Swordsman. (Avengers I#348) - Magdalene accompanied Proctor to the apartment of Melissa Darrow of Earth-616. Proctor then "gathered" Melissa Darrow so that Magdalene could survive and function in Earth-616 indefinitely. (Avengers I#355) - Magdalene joined her fellow Gatherers Cassandra, Swordsman, and Sloth on an alternate Earth on the verge of destruction. This was the Swordsman's first mission and he was quite disturbed by the carnage. Magdalene told Swordsman she was sorry, but she had told him it wasn't going to be pleasant. The Gatherers saved that dimension's last survivor in order to bring him to Proctor so he could be recruited to the Gatherers. This last survivor was an alternate version of the Black Panther called the Coal Tiger. However, the stress put on the Coal Tiger was too great, and for him to survive, it was ruled that Proctor needed to perform what he called a "gathering," in which he would kill the Black Panther of Earth-616 that his counterpart might live. Magdalene protested the mission, saying that it was a bad idea to risk discovery by the Avengers. Proctor firmly told Magdalene that she had no choice. Magdalene hesitantly went along with the mission. To find the location of the Black Panther, the Gatherers infiltrated Avengers' Mansion once again. However, this time the Avengers were ready for them, and a fight ensued. Magdalene knocked out Crystal with her lance, and when Sersi tried to transmute it into something else, Magdalene turned Sersi's power back on her, causing great pain. The battle ended when Cassandra knocked out all the Avengers with a powerful telekinetic blast, knocking them all unconscious. (Avengers I#356) - After going to Wakanda to capture the Black Panther, Magdalene and the Gatherers were again confronted by the Avengers. Magdalene was about to leap into battle when Swordsman stopped her and confided in her that he was confused about the Gatherers' actions, and that it didn't seem right (see comments). Magdalene told Swordsman to wait until Proctor could help him. Swordsman continuously insisted that things seemed wrong to him, but Magdalene insisted on waiting until later when they would have time to explain. In the course of the fight, Magdalene managed to knock out the Vision with her staff. Before long, Swordsman's confusion started to get the better of him, with the help of the Coal Tiger, who was trying to convince Swordsman that the Gatherer's actions were wrong. Magdalene comforted the Swordsman. Cassandra then began to perform a gathering with the Black Panther and Coal Tiger, but was stopped by the Swordsman, who realized that what they were doing was not the right way. Magdalene defended Swordsman, but the Gatherers soon had to make a hasty retreat as the elite Wakandan strike force came to back up the Avengers. Magdalene opened a portal and the Gatherers escaped, except for the Swordsman, whom the Avengers took captive. (Avengers I#358) - Magdalene pleaded with Proctor to let them rescue Swordsman. Proctor agreed and stated that he was going to send the Gatherers on a mission to recruit yet another Gatherer to rescue Swordsman. However, he actually was going to recruit the Swordsman's assassin. (Avengers I#359 (fb)) - Magdalene, Cassandra, and Sloth went to recruit a new Gatherer, an alternate dimensional counterpart of the Vision. It took the full effort of all three of them to capture him, but they succeeded, albeit with minor injuries. (Avengers I#359) - The Gatherers returned to Proctor with the alternate Vision. (Avengers I#360) - Magdalene was present as the Vision of Earth-616 was captured and contained by Proctor and the Gatherers. She was also present when Vision of Earth-616 regained consciousness, and when Proctor switched the minds of the two alternate Visions into each other's bodies. (Avengers I#363) - As Cassandra was torturing the Vision, Magdalene questioned the efficiency of their methods and expressed that she longed to have the Swordsman back. Just then, The Avengers located and attacked the Gatherer's citadel, and Black Knight engaged Magdalene in combat. He quickly gained the advantage over her when Proctor showed up. Magdalene stood by Proctor as he explained himself and some of his intentions to the Avengers. However, the Avengers revealed to Magdalene that Proctor had intended to kill Swordsman. Magdalene snapped and attacked Proctor, who paid her attack little attention. Before long, Proctor activated the self destruct sequence on his citadel. The Avengers and Magdalene managed to escape its destruction, but some of the other Gatherers were nowhere to be found. (Avengers I#364) - Magdalene and the Avengers wandered through the icy peaks of the Andes mountains as Magdalene expressed her shock at the fact that Proctor tried to kill them all. Magdalene expressed her belief that they were all doomed. However, Deathcry soon showed up and told the Avengers that a fleet of Kree Sentries was on the way to attack them and to come with her if they wanted to live. 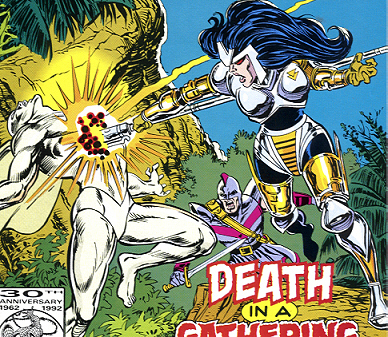 Magdalene and the Avengers fought against the Sentries, and Magdalene even rescued Crystal and Black Knight from a Sentry, although she claimed it was in interest of her own survival. The Avengers managed to defeat the Sentries. (Avengers I#365) - In the aftermath of some attacks across the world by the Kree Lunatic Legion, causing a death toll in the thousands, Magdalene was present as the Avengers used every scrap of technology they had to search for the location of the Kree. (Avengers I#366) - After the Lunatic Legion captured Black Knight, Crystal, Deathcry, and Hercules, the Black Knight managed to contact Sersi via their psychic link, and Sersi and other Avengers and heroes including Magdalene came to the rescue. Magdalene and the Avengers destroyed the Sentries sent against them. Eventually, Sersi transmuted the Nega-Bomb that the Kree were going to destroy Earth with, and the Kree retreated. (Avengers I#367) - Magdalene was waiting at the side of the unconscious Swordsman, still deep in a coma from his assault by the false Vision (Anti-Vision). She had been there ever since they had defeated the Kree. When Vision inquired as to why Magdalene insisted on staying, Magdalene explained to Vision that she was there to give the Swordsman all her love. Swordsman regained consciousness, and Magdalene cried tears of joy at his well-being. (Avengers I#372) - Magdalene, Deathcry, Swordsman, and the Vision flew to the coast of Scotland to investigate the loss of one of the Avengers' tracking stations. Magdalene had the strange feeling that someone was watching them, but the feeling passed. (Avengers I#378) - Unbeknownst to Magdalene or the others, a creature called the Mephistoid had begun to mentally enslave villages near the destination of the Avengers. One of the Mephitisoid's pawns, James Campbell, an engineer hired by the Avengers, attacked them, only to die from terror after being defeated and captured. The Mephitisoid soon confronted the Avengers, and used his power to take control of the Swordsman and Magdalene, who then blasted and incapacitated the Vision. The Mephitisoid's agents took those three back his base. (Avengers I#379) - Magdalene was present when the Shi'ar T'kyll Alabar apologized to the Mephitisoid for his own past crimes, and handed the Mephitisoid a Kree weapon, telling the Mephitisoid to kill him if it would make amends. The Mephitisoid denied him forgiveness, giving him a lethal energy blast instead. When Kor directed the Mephitisoid to force Magdalene to slay the Vision, Deathcry grabbed her blaster and instead slew the Mephitisoid with it. (Avengers I#390) - Lent a place to stay by Tony Stark, Magdalene and the Swordsman welcomed the Avengers to a cookout. After Lockjaw ran off, Hercules, who was clearing brush with Magdalene, ran after him. He returned with the enigmatic Tuc, who read the future of several Avengers members, while Magdalene and the Swordsman watched on. (Avengers I#391) - Later that night, Magdalene awoke to find the Swordsman wandering towards the woods, as if in a trance. (Thunderbolts I#8) - When the Elements of Doom began to exit their base in Central Park and attack New York City, Magdalene was among the heroes who fought to oppose them along with many others. The heroes held their own against the many Elements of Doom until several radioactive elements showed up. Luckily, the Thunderbolts showed up and destroyed the Elements with a destabilization ray. Afterward, Magdalene and the other heroes conversed and bonded with the Thunderbolts and each other. (Avengers III#1) - In Central Park, Magdalene and the Swordsman were attacked by mythological flesh-eating plants. Simultaneously, every former Avenger was attacked by a mythological creature. Eventually, the creatures disappeared. Later on, the Avengers called out all their former members to address the major threat at hand. Magdalene joined with almost every former Avenger at the Mansion and at the press conference where the threat was explained. When the Avenges split into 5 groups to find five separate Norn stones. Magdalene was among the Avengers that went to seek out the Norn stone in the South Pacific. However, it was a trap, and the group of Avengers including Magdalene, Swordsman, Sersi, Rage, Firestar, Justice, and the Black Widow were forced to fight the Midgard Serpent. (Avengers III#2) - When Morgan le Fay used the power of the Norn stones and the Twilight Sword to recreate reality how she wanted it, Magdalene was among the Avengers who were transformed into Morgan le Fay's servants and elite guard, under the name of Lady Magdalena. Several Avengers awoke from Morgan's spell and tried to win over several other Avengers who had been entranced by Morgan le Fay, but it proved a futile effort, and Magdalene was among the Avengers that fought against those awakened from Morgan's spell until the awakened heroes were bailed out by Thor and escaped. (Avengers III#3) - In an attempt to attack Morgan le Fay, the awakened Avengers tried to sneak into her castle in disguise. However, the bewitched Avengers discovered them, and Magdalene was again among the entranced Avengers that fought against their awakened teammates. Eventually, when Morgan le Fay needed to commit too much of her power to fight Wonder Man and the Scarlet Witch, Magdalene and the other Avengers awakened as well. They all focused their wills into the Scarlet Witch, who poured more power into Wonder Man, and eventually defeated Morgan le Fay. (Avengers III#4) - Magdalene was among the Avengers who attempted to prevent a bank robbery by Whirlwind. However, there were too many Avengers, and they repeatedly got in each others' way and Whirlwind escaped. Later on, while forming a new lineup of Avengers, both Magdalene and the Swordsman were asked if they wanted to join. Magdalene and Swordsman replied that while they hadn't made any decisions, they had doubts as to joining the team because it wasn't there world and they felt out of place. (Avengers/Squadron Supreme Annual 1998) - After attending a training session with Captain America, Magdalene and the Swordsman were offered membership slots in the Avengers. They were honored, but declined as the Avengers just reminded them that they were alien to the world they inhabited. Later on, Iron Man and Magdalene worked together for many hours until they managed to create an apparatus utilizing Magdalene's power lance in order to breach dimensions. The Squadron Supreme then crossed over the dimensional barrier to their own world of Earth-S. Magdalene and Swordsman decided to leave Earth as well, deciding that they had nothing to hold them there. They bid the Avengers farewell and left Earth to find their place in the universe. (JLA/Avengers#4) - Pulled forward in time Magdalene fought alongside the Avengers and JLA against Krona's guards. Swordsman was confused because his mind was incredibly addled by the transfer from his own dimension to Earth-616, partly because his counterpart on Earth-616 had been killed long ago. 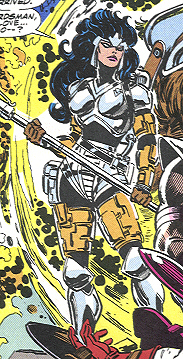 Magdalene was supposed to be a homage to DC's BigBarda, Complete with Big hair, form-fitting armour, and complete with a boom-tube opening power-rod style weapon. Magdalene did have superhuman strength and durability, evident in when she faught Hercules, although not as strong as Herc, her great fighting skills, powerful weapon and tough armour more than made up for it. Thanks to Katu Watcher for pointing out a few mistakes in the power section. Magdalene is seen on the cover of Avengers: The Initiative#1.